Law at the End of the Day: From the Staff of the People's Bank of China and the World Bank Group Finance, Competitiveness and Innovation Global Practice: "Toward Universal Financial Inclusion in China: Models, Challenges, and Global Lessons"
From the Staff of the People's Bank of China and the World Bank Group Finance, Competitiveness and Innovation Global Practice: "Toward Universal Financial Inclusion in China: Models, Challenges, and Global Lessons"
China has been moving aggressively to take its place in the global system beyond serving as "factory to the world." In that connection, its efforts toward the international of the Yuan has not gone unnoticed (here, here, here and here). Nor has Chinese efforts to develop its own alternative foundation for global trade within its One Belt One Road Initiative (e.g., here, here, and here). was jointly written by staff of the People’s Bank of China (PBOC) and the World Bank Group (WBG) Finance, Competitiveness & Innovation Global Practice. The primary drafting team comprised Dangwei Bai (PBOC), Rundong Jiang (PBOC), Tiandu Wang (PBOC), Jennifer Chien (WBG), and Douglas Randall (WBG). The PBOC initially drafted chapters 1, 4, and 5, and the WBG initially drafted chapters 2, 3, and 6. The entire drafting team has extensively discussed and jointly revised all con- tent in the report. (Toward Universal Financial Inclusion, supra, p. vi). Toward Universal Financial Inclusion is useful for a number of reasons. It evidences a level of integration between the Chinese banking sector and the rest of the world. It also points to the willingness of Chinese banks to learn from and coordinate their activities with the global banking and finance sectors. But it also suggests that way that China way be willing to take what it learns and deploy it for its own purposes and to advance its own interest. This last suggests the extent to which the Chinese banking sector has matured--no longer dependent, it has confidence enough to connect but not subordinate its practices. Lastly, the Report reflects the importance of the "New Era" thinking reflected in the 19th CPC Congress Report--and especially its focus on the emerging principal contradiction facing China--"the contradiction between unbalanced and inadequate development and the people's ever growing needs for a better life. . . .The more prominent problem is that our development is unbalanced and inadequate. This has become the main constraining factor in meeting the people’s increasing needs for a better life." (19th CPC Congress Report--pp. 9-10). It is to the amelioration of that basic contradiction--that is to the political project of governance undertaken through the leadership of the Communist Party, that it might be most useful to read and interpret the Report. To that end, Chinese leaders have specifically focused on the reform and broadening of the financial system. "We will deepen institutional reform in the financial sector, make it better serve the real economy, increase the proportion of direct financing, and promote the healthy development of a multilevel capital market." (Ibid., 30). The Introduction (pp. 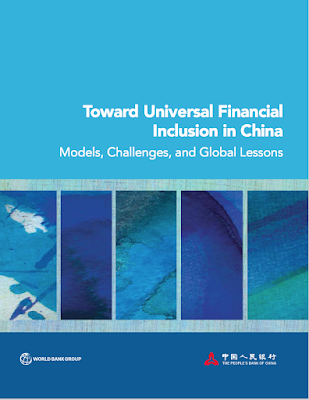 1-3) and Chapter 5 ("Remaining Financial Inclusion Challenges in China and the Way Forward") (pp. 69-73), both of which reflect the People's Bank of China thinking, follow. Chapter 4 ("China's Financial Inclusion Experience") is also worth reading carefully. "Toward Universal Financial Inclusion in China: Models, Challenges, and Global Lessons" (2018). The conceptualization and practice of financial inclusion in China has undergone a signi cant transformation in recent years. From the reforms of rural credit cooperatives (RCCs) and policy banks, to the pursuit of agent banking models, to the emergence and scaling of fintech companies, a diverse range of providers, products, and policy approaches has characterized the recent evolution of financial inclusion in China. And indeed, significant progress has been made. China’s accomplishments include the development of a robust financial infrastructure that has reduced information asymmetries between lenders and borrowers and enabled the safe and efficient transfer of money among individuals, rms, and the government. China has also established one of the largest agent networks in the world, thereby extending the reach of the formal financial sector into previously under- served rural areas. Consumers have responded with high demand for new financial products and services, which are increasingly offered via digitally-enabled business models. China’s rate of account ownership—a basic metric of financial inclusion—is on par with that of other G-20 countries. Yet China still faces many challenges to achieving sustainable and long-term financial inclusion. A modern conceptualization of financial inclusion must be more fully adopted and agreed upon by all relevant stakeholders, in particular local government authorities, many of whom have not evolved past focusing on the provision of subsidized credit. Further efforts are required to ensure that existing models are sustainable and represent a market-oriented approach, with the government playing an appropriate enabling role. Risks associated with new technology-driven providers and products must be better understood and effectively managed and balanced with encouraging innovations in product design and delivery that advance financial inclusion. Further improvements to financial infrastructure are also required to keep pace with industry developments and enable the expansion of digital finance to underserved areas of the country. The current market and policy context represents a unique and potentially transformational period for financial inclusion in China. On the market side, China’s n- tech industry continues to grow and develop, and traditional providers are also actively pursuing digitally- enabled business models. On the policy side, the Chinese government’s current focus on developing an inclusive financial sector is without precedent in the country’s history. One recent marker of this strong focus is the Plan for Advancing the Development of Financial Inclusion (2016–2020), which outlines an ambitious agenda for improving the availability, uptake, and quality of financial products and services in China, with a clear emphasis on expanding and deepening financial inclusion for historically underserved and underserved population segments, including micro and small enterprises (MSEs), rural residents, low-income urban groups, the poor, the disabled, and the elderly. China is not alone in prioritizing and pursuing financial inclusion. Globally, significant progress has been made in broadening the scope and ambition of financial inclusion, and many countries have achieved remarkable results. A supporting factor in this development is the role of inter- national organizations and forums, including the Global Partnership for Financial Inclusion (GPFI), the Alliance for Financial Inclusion (AFI), and the World Bank Group (WBG). These organizations and forums allow countries— and other global stakeholders—to share best practices and models; discuss common challenges; and, where feasible, propel progress through coordinated action. One lesson from these activities is that each financial inclusion “success story” is a product of a unique combination of factors within a given country. The groundbreaking uptake of mobile money in Kenya, the spread of banking correspondents across Brazil and Colombia, and the establishment of niche banks in India and Mexico are examples of pioneering approaches that reflect the particular historical, cultural, political, and financial contexts of those countries. Yet these diverse approaches all seek to address common structural challenges: high transaction costs of serving customers with small and irregular incomes or reaching consumers in rural and remote areas via traditional methods; informational asymmetries that prevent reliable and efficient assessments of creditworthiness; and limited competition and innovation within the market, to name just a few. These are challenges that all countries must address to successfully increase financial inclusion. 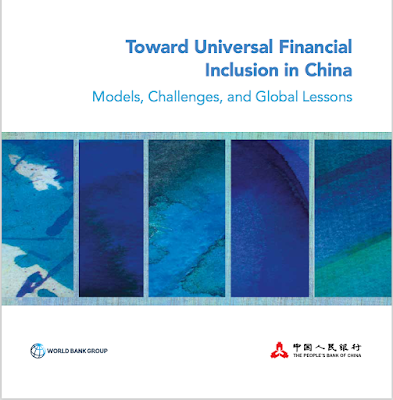 Thus, the goal of this report—written jointly by the People’s Bank of China (PBOC) and the WBG—is to showcase China’s approach to financial inclusion over the past 15 years, highlight remaining challenges, and distill globally relevant lessons. The report builds on the tradition of peer learning now established among countries with a shared interest in expanding financial inclusion. The hope is that the report will assist countries in developing and refining their own pathways toward sustainable and long-term financial inclusion. The terms “digital finance,” “Internet finance,” and “Fintech” are used interchangeably in China. Given this report’s global audience, the authors have chosen to use the term “digital finance” to refer to the broader concept of applying digital technologies in the delivery of financial services that either traditional financial service providers or new entrants can leverage. For the purposes of this report, the term “Fintech companies” refers specifically to those new entrants whose core business model is based on innovative digital finance. Digital finance therefore encompasses both the application of digital technologies by traditional providers (for example, agent-based models, payments infrastructure, online platforms, and the use of big data, which are discussed in section 4.1) and Fintech companies, which are discussed in section 4.3. Section 4.3.8 and chapters 5 and 6 discuss the overall contribution and challenges of digital finance. The rest of the report is structured as follows. Chapter 2 establishes the conceptual foundations of financial inclusion used throughout the report. 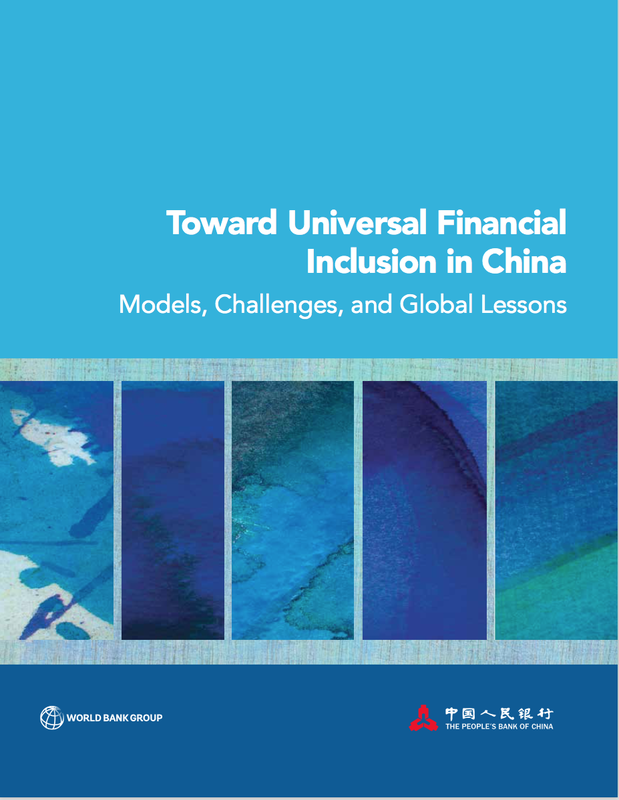 The chapter defines and explores the critical elements of financial inclusion: accessibility, diverse and appropriate products, commercial viability and sustainability, and safety and responsibility. Chapter 3 provides a quantitative benchmarking analysis of China’s current state of financial inclusion as compared with peer countries. Chapter 4 summarizes China’s financial inclusion experience over the past fifteen years. The chapter is not meant to be comprehensive, but rather focuses on key developments, particularly those that may be of relevance or inter- est to other countries. The chapter is roughly organized by categories of financial service providers—(1) traditional providers (e.g., banks, rural credit cooperatives, and insurance providers), (2) “new-type” providers (e.g., village and township banks and microcredit companies), and (3) n- tech companies (e.g., nonbank digital payment providers, Internet-based lenders, and Internet banks)—and explores the role of each type of provider in contributing to financial inclusion. This chapter also discusses the role of the Chinese government in promoting the development of financial inclusion. Chapter 5 discusses the major challenges remaining in China to achieving sustainable financial inclusion over the long term. Finally, chapter 6 discusses globally relevant lessons from China’s financial inclusion experience. 2. PBOC and nine other ministries and commissions (2015). Despite China’s impressive progress in expanding financial inclusion in recent years, significant challenges remain. These challenges must be addressed for China to achieve its financial inclusion objectives and to leverage financial inclusion to support complementary economic and social development goals. This chapter summarizes six key remaining challenges for financial inclusion in China. China’s Plan for Advancing the Development of Financial Inclusion (2016–2020) addresses many of these challenges. Although the concept of financial inclusion has become increasingly popularized in China, significant variations remain in its definition and practice across and within Chinese government agencies, local and national authorities, financial service providers, and nongovernmental organizations, often with counterproductive results. Misunderstandings about financial inclusion have negatively influenced the strategies deployed to promote financial inclusion to date and have played a role in compromising the innovative capacity and incentives of financial service providers and the overall dynamism of the financial sector. For many in China, financial inclusion remains synonymous with credit subsidies, directed lending, and charitable activities. Many stakeholders also believe that only a narrow range of financial products are relevant to financial inclusion (e.g., credit) and fail to consider the diverse set of products underserved segments need or the appropriate design of available products. Furthermore, some believe that no demand for financial services exists in underserved areas and that financial service providers operating in these areas must be heavily subsidized. The reality is more nuanced. Yet in China, numerous stakeholders still maintain a simplistic view of financial inclusion and do not fully comprehend the nuances of financial inclusion as described in chapter 2, or as outlined in China’s Plan for Advancing the Development of Financial Inclusion. Going forward, government authorities who drive and coordinate China’s financial inclusion agenda must ensure that a comprehensive conceptualization of financial inclusion is understood and practiced at all levels of government and across all public and private stakeholders. This may be particularly true with respect to subnational authorities who do not benefit from access and exposure to global forums and resources. A broad shift in the conceptualization of financial inclusion is necessary to outline a vision for achieving full financial inclusion in China and to evolve government practices and policies to address the remaining challenges to achieve such a vision. This vision should clearly articulate what pursuing market-based, commercially sustainable approaches to financial inclusion means in practice, and it should ensure that this common understanding is implemented across all levels of government, with improved coordination and communication to allow harmonized, consistent approaches. Financial inclusion and digital nance must also be recognized as separate concepts. Digital finance—including as practiced by Fintech companies—is not the automatic equivalent of financial inclusion. Rather, digital finance is the combination of innovative technologies applied to the financial sector, while financial inclusion combines specific business models and design of financial products and ser- vices intended to serve underserved population segments. Digital technologies can be used to further financial inclusion, but they are an approach and not the objective itself. However, many Fintech companies in China currently advertise themselves as “ financial inclusion” institutions, a notion that many in the general public consequently share. In reality, several Fintech companies operate businesses that have little to do with financial inclusion. While many financial products offered by Fintech companies may serve a legitimate consumer need, such products do not meaningfully expand access for unserved and underserved consumer segments. As discussed in chapter 4, some ntech companies also infringe upon the interests of consumers through fraud and questionable business practices. This not only undermines the industry’s reputation, but also negatively affects the general understanding of financial inclusion. As this report clearly shows, extensive and active government support for financial inclusion has been a hallmark of the Chinese experience. National and local governments have used a mixture of direct and indirect interventions to spur financial inclusion, including a wide range of policies, regulations, and promotional measures. These government efforts have achieved considerable levels of success along certain metrics. As noted in chapter 3, high levels of account ownership have been obtained in China. Absolute numbers of access points have increased in rural areas, and greater numbers of SME units are present within banks. After the broad economic reforms of the late 1970s and early 1980s, China has continued to promote the process of marketization, including in the financial sector. However, China’s economy and nancial sector still retain many features of emerging and public sector–dominated economies. Sustainability of the business models many financial service providers use to advance nancial inclu- sion efforts has been a perennial concern, limiting the potential for ongoing viability and further expansion. For example, as noted previously, a nontrivial share of agent- based service points are dormant or have limited traffic. Similarly, the extent to which SME units in banks have translated into greater access to nance for underserved SMEs is unclear. High levels of state intervention in state- owned commercial banks or state-influenced financial service providers also discourage competition and innovation, as these providers are often inefficiently run and do not operate on market-based principles, while having a distortive effect on the market. Highly subsidized products such as credit or insurance products can have a similarly distortive and chilling effect over the long term. Finally, administrative intervention by some local governments in the routine operations of financial service providers raises questions of interference and issues of mismanagement. Overall, this approach fails to lay the groundwork for long-term, sustainable financial inclusion. Therefore, one key challenge for Chinese authorities going forward is the need to think clearly and strategically about the appropriate role of government, the appropriate mix of direct and indirect public sector measures, and the interplay between the public and private sectors. The public sector alone cannot drive financial inclusion, at least not beyond a certain point and not on a long-term, sustainable basis. The private sector must play a critical role and do so based on market principles and via viable business models for positive impacts of financial inclusion to be sustainable. This new thinking is reflected in Plan for Advancing the Development of Financial Inclusion (2016– 2020), which highlights commercial sustainability as one of its core guiding principles. As basic metrics of financial inclusion such as access to transaction accounts are achieved and Chinese markets evolve, a shift in focus is required toward more market-based approaches and private sector–driven efforts, particularly to encourage innovation and competition in providing a broader range of appropriate financial products and services and to ensure scalability. The entry and subsequent successes of ntech companies—in China and elsewhere—show the potential impact of this approach. Continuing down the path toward marketization is critical to fostering a dynamic and innovative financial sector, which in turn is a key enabler of financial inclusion. The public sector still has a critical, meaningful role to play. However, the role of government should not (and cannot) be to “mandate” commercial sustainability. Rather, the appropriate role of government is to develop an enabling environment for financial inclusion—including the overall policy and coordination framework, legal and regulatory environment, and supporting financial and information and communication technology (ICT) infra- structure—and to correct market failures where they exist, so that providers can serve the underserved in a commercially viable manner. A legal and regulatory framework that provides clear market participation rules and establishes a fair, open, and level playing eld for market participants, considering relevant risks and supervisory capacity, is a critical function of the government, as noted in the G-20 High-Level Principles for Digital Financial Inclusion. Chinese authorities should also continue to prioritize the development of credit infrastructure, payments infrastruc- ture, ICT infrastructure, and data infrastructure to support nancial inclusion. The government must also continue to play a key role in protecting and educating consumers and ensuring the soundness and integrity of the financial system as a whole. Finally, government efforts to strengthen the rule of law by improving law enforcement ef ciency, cracking down on improper and illegal financial activities, and protecting the legitimate rights and inter- ests of creditors and debtors can contribute meaningfully to long-term and sustainable financial inclusion. Careful thought should be given to those particular circumstances where a more direct public sector role is war- ranted. In such cases, the public sector role should be clearly articulated and delimited, with an exit strategy where appropriate. For example, expanding financial inclusion to reach the final stretches of the last mile is one instance that may require more direct government involvement. But in such cases, sophistication is required to direct government assistance in a productive and minimally distortive manner (such as integrating with social safety net payments) to target appropriate individuals and clearly articulate the gap in needs and the intended impact. Commercial sustainability is not only a foundation for sustainable financial inclusion but also a basic condition for maintaining the overall financial system’s efficiency and soundness. However, significant barriers remain in achieving commercial sustainability for many providers in China. In remote or rural areas with small populations, low per-capita income, undiversified economies, and under-developed infrastructure, financial service providers may struggle to operate profitably. In urban areas, financial service providers also face such problems as information asymmetry, lack of pledges or mortgages, incomplete credit data, and high transaction costs. Improving commercial sustainability requires a cultural and business model shift by some financial service providers toward market-driven innovation and customer centricity. Financial service providers’ corporate governance, internal management systems, and product design and delivery approaches must adapt and innovate to achieve commercial sustainability and compete with new market entrants. Chapter 4 includes several examples of traditional financial service providers leveraging new technologies and adapting to a more dynamic and competitive marketplace, to the benefit of financial inclusion. More of this trend is required to achieve operational efficiency, improved customer service, better product and service offerings for the underserved, and more conducive delivery channels to a broader range of customers. The success of various financial products and services now offered via digital means by new market entrants clearly illustrates that traditionally underserved segments can be served profitably. Indeed, the Plan for Advancing the Development of Financial Inclusion attaches great importance to the use of technology for expanding the breadth and depth of financial services for the underserved. To this end, the plan proposes to carry out explorations in the following three areas: (1) encouraging nancial service providers to innovate with respect to financial products and services, (2) enhancing the capacity of financial service providers to use technology, and (3) leveraging the useful role of the Internet in promoting the development of financial inclusion. The experience of establishing broad agent networks in China provides an instructive example. As described in section 4.1.1, due to high prioritization and strong sup- port from financial sector authorities (including subsidizing set-up costs in some provinces), initial successes have been achieved on a significant scale in terms of expand- ing the network of agents in rural areas across China utilizing POS terminals for transactional services. The next stage to achieving long-term nancial inclusion is now determining how these agent-based service points can be reoriented to operate in a more sustainable manner and be more fully leveraged for financial inclusion purposes (i.e., moving from rural cash withdrawal points to fully edged, multifunctional agents). Such a shift in thinking requires reconsidering the business models of agent operations and analyzing the actual needs, demands, and behaviors of rural consumers to ensure that market-driven, sustainable models are developed. For example, reforms could allow for a broader range of services to be provided by certain agent-based service points, encourage greater optimization in the placement of agents, integrate the other payment needs of merchants and users into digital payment products, and loosen caps on agent fees and daily transaction limits. For its part, the government should reconsider practices that disincentivize the achievement of commercial sustainability, such as excessive, poorly targeted, and/or open-ended subsidies and tax reductions/exemptions, targets for directed lending, and interference in governance and management. As discussed previously, the government must also reorient its focus to developing the overall enabling environment for financial inclusion. Aspects of the legal and regulatory framework that hinder the achievement of commercial sustainability should also be reformed, for example with respect to ownership and geographic restrictions imposed on microcredit companies (MCCs) and village and township banks (VTBs). Achieving long-term and sustainable financial inclusion requires innovation, particularly to fully leverage digital technologies. Yet digital finance models carry significant risks. The 2016 Global Partnership for Financial Inclusion (GPFI) white paper64 points out that the evolving risk landscape for financial inclusion reflects characteristics that are inherent to digital finance: (1) new providers and new combinations of providers, (2) digital technology, (3) use of agents as a primary interface with customers, (4) new products and services and their bundling, and (5) the profile of financially excluded and underserved customers. The implications of these risk characteristics are wide and varied. Operational risk is heightened due to the use of digital technologies, mass scale, and the possibility of large system failures. Consumer risk is heighted due to concerns such as possible loss or abuse of client information or lack of disclosure regarding the practices of new business models. All such risks are further heightened when regulation lags significantly behind and does not constrain irresponsible market practices—factors that are particularly relevant for new Fintech companies, which often operate under still-evolving legal and regulatory frameworks. Indeed, at their core, Fintech companies per- form the basic functions of finance and therefore have risks common to traditional providers, including liquidity risk, settlement risk, operational risk, money laundering and terrorist financing risks, and consumer protection risks. However, many Fintech companies have distinct characteristics that heighten or expand these common risks and in some instances generate new risks. China’s experience with the peer-to-peer (P2P) industry highlights these risks and the consequences if such risks are not well understood and actively managed (the Ezubao case is a notable example, as discussed in section 4.3). The implications of these risks of course extend beyond financial inclusion. They affect the overall safety, soundness, and integrity of the financial system and the degree to which consumers are protected. Of course, providers can also use digital technologies to reduce risks, for example to reduce information asymmetries in lending decisions. Regulatory authorities in China, as elsewhere, therefore confront the challenge of balancing the dual objectives of creating an enabling environment for innovation while monitoring and managing risks. Indeed, China’s own Plan for Advancing the Development of Financial Inclusion emphasizes the need to effectively manage risks in the financial system. Addressing this challenge requires evolution in supervisory approaches and capacities. The clarification of regulatory and supervisory responsibilities in the 2015 Guidelines on Promoting Sound Development of Internet Finance was an important rst step in this regard. The 2016 Implementation Plan for the Special Campaign to Address Risks of Internet-based Finance was another critical development toward managing risks associated with financial sector innovation (see box 4.6). More work remains to establish a comprehensive legal and regulatory framework that reflects the new or heightened risks posed by digital finance. In addition, supervisors must be equipped with expertise and knowledge about new providers, products, and business models, and sufficient staffing and resources will be required, including leveraging digital tools for supervision. In this regard, supervisors can also leverage digital technologies to monitor and manage risks via “regtech,” which Chinese authorities are already exploring. For example, modern reporting platforms can improve the scope, frequency, accuracy, and granularity of data provided to financial sec- tor supervisors, allowing them to monitor the market in near real time. Strong and active coordination among supervisory bodies, including outside the financial sector, will also be necessary to reduce overlaps, gaps, and inefficiencies—the value of coordination in balancing innovation and risk is highlighted in the G-20 High-Level Principles for Digital Financial Inclusion. Learning from other countries and international bodies that are dealing with similar issues in this fast-moving space will be critical. VTBs and MCCs were established in China as new-type rural financial service providers with the speci c objective of improving financial inclusion in rural areas. As described in section 4.2, though these providers have achieved a certain degree of success—within each provider type, high-performing providers can be found—significant improvements are needed in the operations, governance, and regulatory environment for such providers to better realize their potential to contribute to financial inclusion. For example, major problems VTBs face include high operational and management costs and limited innova- tion. Major problems MCCs face include a narrow range of funding sources, high costs, and heavy tax burdens. An urgent need also exists to enhance MCCs’ risk management capacity. Recent years’ practices suggest a severe neglect of risk controls by MCCs seeking to achieve short- term pro ts. For example, MCCs have lent large amounts in loans to steel and iron, trade, and coal enterprises, all of whose operations are heavily subject to impacts of the economic cycle. Both VTBs and MCCs face other regulatory constraints to their operations, resulting in low mar- gins and challenges to sustainable growth. Various reforms would be beneficial to improve the development of VTBs. Fostering more independent governance by reducing excessive intervention and control by sponsoring banks is necessary and will allow VTBs to more fully leverage their comparative advantages of operational ef ciency and exibility. More exible capital sources for VTBs should also be permitted. For example, where cer- tain conditions are met, private capital should be allowed to establish VTBs as the main investors. Multiple VTBs could also form linkages in the same geographic areas to achieve efficiencies of scale in management costs. Regulatory reforms may be needed to enable such actions. With regard to MCCs, the following reform options should be considered: (1) define the role and purpose of MCCs more clearly and incorporate this purpose into high-level institutional documents; (2) review the legal and regulatory framework to remove barriers to MCC operations, such as increasing the permitted percentage of external financing, providing more exible leverage ratios for qualified MCCs, and allowing for expanded operations beyond a single county’s boundaries; (3) establish greater consistency across provinces with regard to the regulatory and supervisory framework for MCCs, in particular addressing those localities where high entry barriers are imposed; (4) undertake efforts to enhance MCCs’ risk con- trol capacities; (5) leverage tax policies to incentivize MCCs to serve target sectors and populations; and (6) conduct ratings of MCCs for financial inclusion objectives and allow those MCCs that obtain higher ratings to trans- form into VTBs. These reforms can help to increase MCC’s commercial sustainability and allow them to further con- tribute to reaching the underserved. In addition, new-type rural financial service providers should better leverage digital technologies. With the development of telecom infrastructure, improvements in rural financial infrastructure, and rapid dissemination of smartphones in rural areas, digital technologies have penetrated into all economic and social sectors. Such expansion in ICT infrastructure should be better utilized by new-type rural financial service providers to reach customers via new models and faster, lower-cost channels. To achieve further development, new-type rural financial ser- vice providers should also leverage digital technologies in management, product research and development, marketing, customer service, and other fields. A 2017 PBOC survey revealed that Chinese consumers perform well in some aspects.65 For example, they view financial consumer education positively and tend to be rational in consumption, savings, and credit; families often have expenditure plans; consumer behavior on loan applications and credit card repayment is reasonable; and consumers usually know how to get financial knowledge and how to resolve financial disputes. However, the 2017 survey revealed less satisfactory aspects, including relatively low risk awareness among consumers, lack of execution on family expenditure plans, and insufficient understanding and usage of contracts and statements of financial products. The overall level of financial knowledge is relatively low, and a significant imbalance exists between rural and urban areas and among different regions. Relatedly, in some regions, a poor credit culture exists among enterprises, individuals, and even local governments, with some parties having a low regard for commercial credit or the financial obligation that it entails. In addition, financial consumers’ lack of knowledge about digital technologies discourages them from using digital financial services or leaves them vulnerable to inappropriate products and services, undermining their self-interest and leading to problems and risks in the development of digital finance. Effective financial consumer education can facilitate the development of financial inclusion. To achieve this objective, financial literacy surveys conducted on a regular and long-term basis can help establish and monitor the knowledge level of consumers and their behavioral changes. By identifying the weaknesses in financial knowledge and behaviors of consumers, these surveys can also help to inform the design and improve the effectiveness of financial education activities. Such activities should focus on conveying the basic financial knowledge needed in daily life, tailored for various types of consumers, to ensure that consumers obtain financial knowledge compatible with their needs, behavioral characteristics, and existing knowledge levels. Educational efforts should also help guide consumers in how to correctly use financial knowledge and how to conduct self-appraisal of risks and select suitable financial products according to their own risk-bearing capacity and the risk characteristics of relevant products. 65. This survey comprehensively reflects the financial literacy status of existing Chinese consumers from multiple angles such as attitudes, behaviors, financial knowledge, and financial skills (PBOC, 2017).